U.S. citizens possess this right under the Cuban Liberty and Democratic Solidarity (LIBERTAD) Act of 1996, commonly referred to as the Helms-Burton Act. The law also allows American citizens to sue any foreign corporation that conducts business in the United States for profits they have made in using stolen property, threatening corporations like Carnival Cruises, which inked a deal during the Obama era to use stolen ports in Havana and Santiago de Cuba. Individuals who were not American citizens at the time of the Revolution may also use the law to bring cases to U.S. courts. No Americans have been allowed to exercise the rights provided by this law because the State Department has suspended it every six months for the past 23 years. In a press release Wednesday, Pompeo suggests the Trump administration may end this limitation. Pompeo suspended the law for 41 days beginning on February 1, an unprecedented move. “This extension will permit us to conduct a careful review of the right to bring action under Title III in light of the national interests of the United States and efforts to expedite a transition to democracy in Cuba,” the State Department notes in its release. The State Department made this determination two months after a report surfaced suggesting that Pompeo had begun considering allowing these lawsuits. News service McClatchy reported that prior to National Security Advisor John Bolton’s announcement of further sanctions that month on Cuba, Venezuela, and Nicaragua, the State Department had begun considering the unprecedented move of allowing the victims of the Revolution to exercise their rights as provided by the law. Cuba has an estimated eight billion dollars to lose if forced to pay for the property stolen from Americans and Cuban refugees during the Revolution, largely consisting of ports, farmlands, and privately owned businesses. The U.S. has reportedly documented the existence of at least 6,000 larceny claims against the Castro regime. 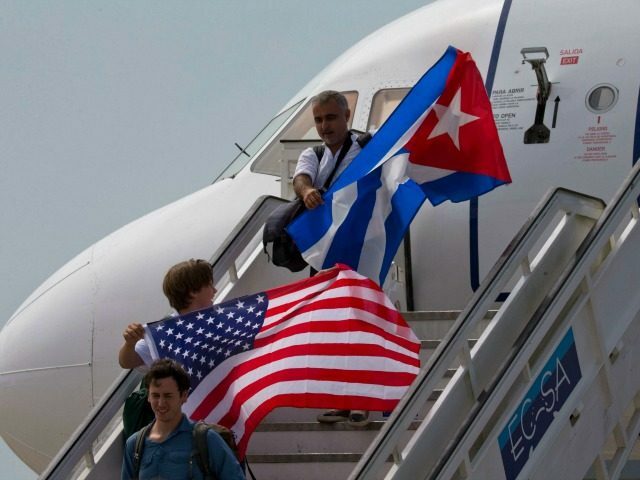 The Cuban regime reacted aggressively to the State Department’s announcement.